1932 Series started the cricketing relation between India and England, and the international Cricket journey of India. The series with only one test was duly won by England. Maharaja of Porbander was the unlikely captain of the tour due to political waves involved. But the only test match would be more remembered for the record feat of Indian bowlers – Nissar and Amar Singh. Setting was historical Lordâ€™s, English captain was Jardine who was to soon become infamous for his Bodlyline series against Australia to tackle Don Bradman. Indian team was set to debut their international run in Cricket. With only one test to start for the first-ever international series of India, the expectation was more of an exhibition match. But the match showed tense moments for England. England captain Douglas Jardine won the toss and elected to bat expecting to score big. Indian captain CK Nayudu introduced his pacers Nissar and Amar Singh to attack the famous English top order. Nissar struck early and the score was soon reading 3/19. 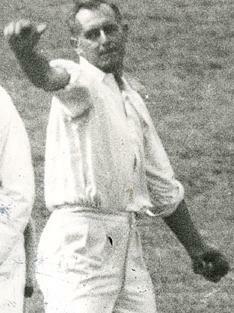 Jardine steadied the innings in the company of Wally Hammond (35 runs) and then wicketkeeper Ames (65 runs). With 5 wickets from Nissar, 2 each from Amar Singh and CK Nayudu English first inning folded at 259. As expected Indian batsmen could not survive longer scoring 189 and conceding a lead of 70 runs. Surprisingly the start was promising for India as they were 160/5 at one stage. Bowes (4 wkts), Voce ( 3 wkts), Robins (2 wkts) and Brown (1 wkt) brought the curtain on Indian first inning. The second innings of England saw England declaring on 275/8 with another half-century from Jardine, undefeated 85 and half-century from Paynter. This time Jahangir Khan and Amar Singh rocked the English top order reducing them to 67/4. Jahangir Khan took 4 wickets, Amar Singh 2 and Nissar took 1 wicket. Requiring 346 runs to win the first test match on debut, India could score only 187 runs. While Hammond took 3 wickets, Bowes, Voce and Frown grabbed 2 wickets each and Robins took 1. Top-order could not pose any challenge while chasing the target. Amar Singh’s 51 was the only proud part of Indian innings. As expected India did lose the match and series, but it was not heartbreaking. The margin said 158 runs, a huge margin. But, the Indian bowlers showed the future was bright for Indian Cricket team. Surprising all the Indian bowlers did not allow opposition run away with the match in their first match. Jardine, the English captain infamous for his Bodyline tactics could control the Indian batsmen but his two half-centuries could not motivate his batsmen to tackle the Indian bowlers, particularly Md. Nissar. Indian bowlers ensured that there would be no centuries in the first test match they play. Nissar became the first bowler in India-England series to grab 5 wicket haul in an innings. His 5/93 motivated Indian bowlers to grab all 20-wickets available during England innings. But the English bowling unit was too much to bargain for a win for the first-timer Indian batsmen. Bowes of England and Nissar of India took 6-wickets each in the match. English captain Jardine was the highest scorer of the match with half-centuries in both innings. For India Wazir Ali aggregated the maximum runs, but it was the bowler Amar Singh who became the first batsman from India to score a half-century against England. The allrounder also grabbed 4-wickets in the match, 2 wickets in both innings.